Join the ride and play Nitro Circus, a 5-reel 3-row 25-payline video slot machine published in cooperation with one of the world’s major sports brands and Yggdrasil. Celebrating the launch of “You Got This” European Tour, the game comes with Vehicle Collection, Wilds, Scatters, Nitro Free Spins with Multipliers, and Bonus round that eventually result with the jackpot worth no less than 10.000 coins. If interested to learn how to win any of those prizes, read the Nitro Circus slot review. We have no free play mode available yet, but take a look at the Nitro Circus screenshots instead. Or why not simply giving a try with one of the recommended casino sites above? 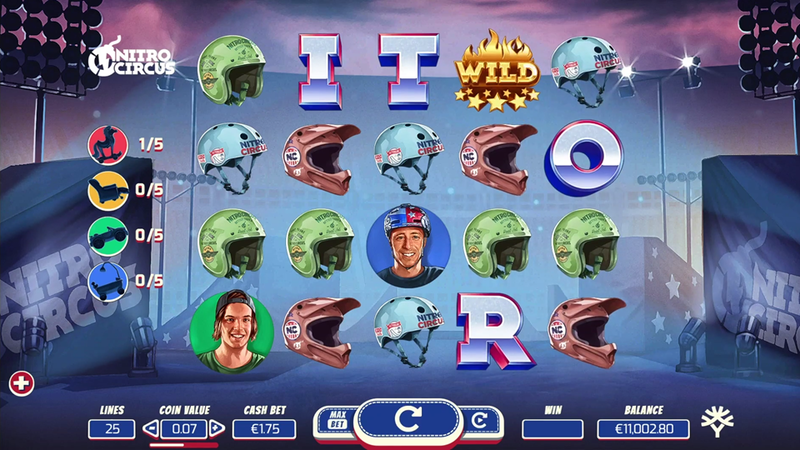 The paytable consists of themed symbols representing racing helmets and their respective driver champions combined with low-paying words you’ll still need to activate the Nitro Circus bonus. During the base game, 3, 4 or 5 Nitro Bomb Scatters grant 10, 20 or 30 extra spins with 1, 2 or 3 picks, respectively. Each Nitro Bomb awards a random prize whether it be a Multiplier of an additional batch of spins. You can also take Wilds, while each new winning combination increases the Multiplier by 1x. Collect all 5 N-I-T-R-O letters to activate the Nitro Jump Bonus game. Now, choose the vehicle with distinctive stats including “Tricks” for higher coin rewards, “Boost” for the higher multiplier in the final jump, or “Size-2 that allows more items to be collected. As soon as you start playing, the game will grant 1 random collectible symbol to help you a jump-start. Use those picks to boost your vehicle and get a step closer to the Final Jump that further leads to the jackpot prize. Additionally, 2 Bombs in the base game trigger the Nitro Blast mini-game awarding collectible items, Wilds, 10, 20 or 30 extra spins. Tricksters are symbols with the highest payout rating that pay 25 to 500 coins for combinations of 3 to 5 of a kind. Helmets are low-paying icons granting 10 to 60 coins for the same number of icons on an active payline. Besides, it’s possible to set up your own strategy with the coin denomination from €0.01 to €5 and wagers between €0.25 and €125 per round. Finally, you can play for fun or for real money, depending on your overall experience. Collect 5 identical vehicles (Armchair, Bath Tub, Rocking Horse and Toy Car) appeared anywhere on the reels and complete word NITRO to trigger the Nitro Jump Feature. Each car has its own characteristics (tricks, size and more) that contribute to a higher prize. Depending on them, a lucky winner may eventually end up with 25 coins, Speed Boost for the Big Win, Multiplier and 10 extra spins. You can play online using any mobile device on various Yggdrasil sites because there is no need to download the iPhone app or the Android .apk file. 3. What is the RTP factor of Nitro Circus? According to the official info, the RTP is 97.00%. Introducing sports racing fans to the online casino experience and at the same time bringing a fast-paced arena action to the reels, this is a release that combines the best of both worlds. No matter if you’re a newbie or more experienced player, you’ll surely appreciate the opportunity to try the demo and see what’s under the hood.